We can hardly believe this, but its 21 years since we first met Emma - and she is one of our favorite people! Emma works at Arrow ECS, which has undergone several incantations since 1991 when the company was called Level V.
In this world of change it is good to know that it is still possible to keep up to date with technology, trends and styles and yet maintain a strong working relationship. 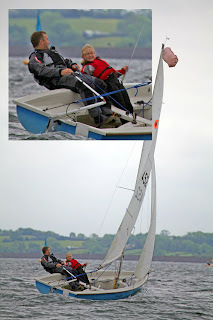 The picture shows Emma’s daughter Selina and husband Simon (a qualified sailing instructor) showing her the ropes…or is it the other way around?! Congratulations to Emma on the recent birth of her second daughter Eve – who will have to get used to the outdoor life too no doubt!